If you are going to take the leap into genealogy, there are a couple of truths you must face: first, that things are not always as they appear to be and second, always be prepared to make new and even more fascinating discoveries. In my last article, “Guardians of the Forest” I detailed my foray into the study of my local family, the Woodward line, whose presence here dated back to the founding of my home county and beyond. Having uncovered information that was admittedly out there but unknown to any of my local family, I was excited to write words that detailed the family struggles that ensued among the children of the Woodward patriarch, Aaron Woodward, stories of legal battles, a trip to the State Supreme Court and a missing daughter on top of everything else. I highlighted the fact that on the monument to Aaron, placed there by his grandchildren and great-grandchildren in the Woodward family cemetery were the names of eight children and I also highlighted that my recent discoveries had uncovered the existence of a ninth child whose name was missing from it. Not just any child either but his firstborn child, Sarah Woodward. I and others have erroneously drawn the conclusion that the legal battles that appeared to be initiated by Sarah against her four younger brothers over their father’s estate resulted in Sarah’s departure from the family and ultimately her being expunged or omitted from the family line completely. Remember the first truth? Things aren’t always as they appear to be. 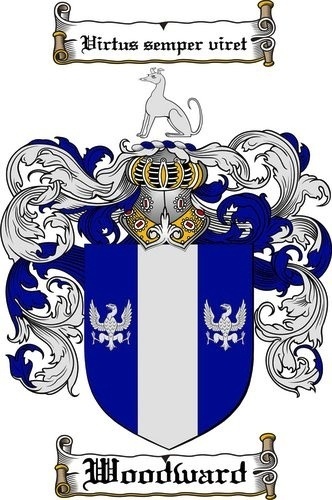 Within a couple of days of my post, I received a WordPress message from Lynda Moreau with the startling news that she was the direct descendent of Sarah Woodward, daughter of Aaron Woodward and the wife of Thomas McClendon. Such is the power of the internet that allows one person to post something for someone else who is looking for information to find. A couple of emails later, an appointed time was set and earlier this evening, I had a conversation over the telephone with another Woodward descendent who had both information to share and the undivided attention of yours truly. It’s time to put Sarah Woodward McClendon to rest. As I wrote in the “Guardians” article, Aaron Woodward was born, we believe, in 1766, which would have made him ten years old when the American Revolution began. On June 17th, 1800, he married Chloe Ann Ousley, the great-granddaughter of the noted Virginian Thomas Ousley, and they moved to what would eventually become Butts County, Georgia. Around 1802, their first daughter Sarah was born. Aaron was 36 when he had his first child (I can relate to that, I was 38) and four more daughters would follow: Hanna, Nancy, Polly and Matilda, followed by four sons: Aaron Jr., William, Newdigate and lastly, Robert, born in 1824 when Aaron was 58 years old! Aaron was a very successful businessman and farmer because when died on January 10, 1851, his estate was valued at $40,000.00 and in addition to his land in Butts County, he held 70 acres in Walton County and 40 acres in Cherokee County. The land in Walton and Cherokee counties was new information for me, thanks to the research of Lynda Moreau and there was still more new information to come. Sarah Woodward, the oldest daughter, married Thomas McClendon on April 4, 1819 in Jackson County, Georgia. At the time of their marriage, she was approximately 17 years old and he was approximately 28 years old, having been born sometime around 1791 or so. The 1830 census indicates a possibility that they may have lived in Henry County but prior to 1825, all the Woodward family was technically living in Henry County because Butts County had not been formed yet and the area they lived in was still part of Henry. What is definitely known is that by the time 1840 census rolled around, Thomas and Sarah were living in Chambers County, Alabama, just a short distance past the Georgia-Alabama state line. Depending on what year they moved there, they could have been in Alabama anywhere from 1 to 9 years by that time. Aaron Woodward was still alive in 1840 and shown to be living in Butts County still. Census records also help to support the theory that Chloe Woodward died sometime in the 1840’s, leaving behind an elderly widower, Aaron, whose physical and mental faculties were failing. By the time Aaron was going downhill, Sarah and Thomas were living in Alabama, which at the time might as well have been another country away. All the other daughters and three of the sons were married by 1846; only Newdigate remained single and to him fell the task of looking after his father’s large holdings. During this time, Newdigate apparently began to appropriate for his own use the property of his father, apparently unknown to the rest of the siblings to begin with. Bear in mind what I said about appearances though…in Newdigate’s defense, he was the one who got saddled with the job of looking after Aaron who was in the period of his late seventies and early eighties; it was established in court documents that he had been senile for at least eight years at the time of his death in 1851 (perhaps he began to fail when Chloe died, which might put her death at about 1843) and he was quite likely a handful to deal with at times. Newdigate may have felt what he was taking out of Aaron’s holdings was just compensation for what he had to deal with. He did gain some help when he got married to Sara Jane McKibben on March 15, 1849 but on January 10th, 1851 Aaron Woodward died at about the age of 85, leaving Newdigate and his pregnant wife on the farm. Now things begin to get interesting. With both Aaron and Chloe gone, the Woodward estate was now subject to being probated. When the family began to look into things, it is likely at this time they discovered the full extent of Newdigate’s pilfering, possibly even before Aaron died; perhaps they challenged him on it. This is supported because the court documents later showed that various deeds to property, both real and personal, had been given to different brothers, diminishing the value of the estate so it is possible that they male Woodward heirs were in some sort of agreement. Whatever the case was, we may never know the full story but it obviously caused some family strife among everyone. William J. Woodward, the second son of Aaron, moved quickly and had the Probate Court (Ordinary at the time) appoint him as the Administrator for Aaron’s estate. It has been theorized that he was involved in collusion with his other brothers, if in fact collusion did occur, but it has also been theorized that William moved on this appointment quickly to prevent any further loss of assets to the estate. Aaron Woodward had seemingly died intestate without a will so he had not named an executor either. The reason this second theory sounds more likely is because William subsequently filed a suit against Newdigate in August of 1851, claiming that Newdigate had sold crops, hired out servants and engaged in various other acts that had diminished the body of the estate. A period of time went by where apparently the four brothers did work together on the estate, although it is presumed that they were trying to help Newdigate get the estate back together or in some semblance that would pass court inspection. Whatever the case was, another lawsuit erupted from this in 1854, and it was not filed by just “Thomas McClendon and Wife” but by Thomas McClendon and Wife and Others, heirs and distributees to the estate of Aaron Woodward. The “Others” were, in fact, the other four sisters, Hannah, Nancy, Polly and Matilda. Court documents of the day normally list just the names of the first party to a suit and list the rest as “and others”. Previously I had mistakenly included only Thomas and Sarah, painting this as the setting for her departure from the family but this was not what really happened. The case made its way slowly through the court system; the lower courts did not effectively reverse any wrong that might have been perpetrated by the brothers against the sisters so appeals kept the case moving forward and upward in the judicial system..but it wasn’t Sarah Woodward McClendon that was leading the charge…in fact, it was quite likely that Sarah and her husband were back in Chambers County, Alabama looking after their seventeen children and leaving the lawyers and the other heirs, all closer to Jackson, to shepherd the case through the system. They were not in need of the estate of Aaron Woodward because records researched by Lynda Moreau indicate that Thomas was quite well off and possessed a great deal of property. It was a moot point anyway because the following year, on June 21, 1855, Sarah Woodward McClendon died in Alabama, only four years after her father did and the following February, Thomas McClendon joined her in death. Per his express wishes, his estate was liquidated and his children, who ranged in age from adults down to four years old, took the proceeds, left Alabama and relocated, eventually settling in Union County, Arkansas. Exactly how, when or even if the rest of Sarah’s family in Georgia were notified of her death remains unknown but the case moved forward, eventually ending up in the Georgia Supreme Court, 1858 Term, where it was not dismissed. The opinion of Chief Justice Lumpkin indicated his belief that there was more to be sifted through and examined and that it was possible that the charges indicated by the sisters was true but because of how they had filed the suit, the Justices had to affirm the lower court but Lumpkin made it clear that the court’s decision was affirmed with leave to amend….meaning “we are leaving the door open on this one for you to bring it back in the proper manner, especially should more be determined”. I don’t have any more information after that, what remedies may have been sought or what kind of deal might have been made by the remaining sisters. Perhaps they chose not to continue to pursue it or maybe the brothers made things right afterwards but life went on. Just two and a half years later, the entire South was engulfed in the Civil War and after it was over, the county and much of the South was in a shambles; economically it was more devastating than any plague or event before or after it and it is likely the Woodward family had to pull together to survive it. Several of the Woodward men served in the armed forces for the state; Newdigate in particular, who was 41 when the war began, rose to the rank of Colonel by the time the war was over. He died on his 69th birthday in 1889. Robert J. Woodward, my great-great-great grandfather, lived probably longer than any of the boys, 79 long years and dying in 1903. 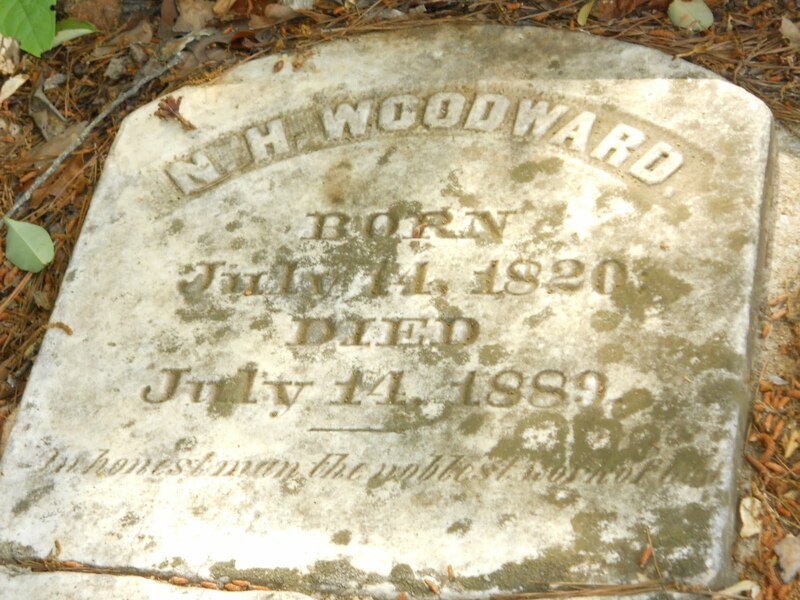 Aaron Woodward Jr. is not yet accounted for as to when he passed away but possibly the first to go was William J. Woodward, who was the court-appointed administrator of the estate of Aaron Woodward….and William went to his grave with one more secret that has yet to be explained. According to information received over twelve years ago by Lynda Moreau, after William’s wife died in 1860 at the young age of 38, William subsequently remarried to a Spalding County citizen and they remained together until his death in 1873. The second Mrs. William Woodward, having no children and apparently no ties to keep her in the area, decided to move to Texas to live. On her way out of town for good, she stopped off at the house of William’s son, John R. Woodward, and left him something that had belonged to his father and which she thought he needed to have. Reportedly, they comprise the Last Wills and Testaments of Aaron Woodward that William had kept in his possession but which were never presented to the Court at the time the estate was to be probated. John Woodward died in 1946, in his 90’s and these two documents, if they truly existed, have never surfaced again. According to the source of the information, which was deemed to be a credible source, the wills named all nine children of Aaron Woodward as beneficiaries of his estate. So why did William, by all accounts a good and honorable man (even the court documents state that he didn’t take possession of nearly all the property that had been conveyed to him in the purported deeds from Aaron prior to his death) not disclose these wills to the court to be probated? Again, we may never know the answer but it is likely he may have been trying to protect Newdigate or his other brothers, or all of them, from possible legal action. Maybe the Will named someone else as the executor, perhaps his older brother Aaron Jr. who was not appointed Administrator as would have been the custom of the time and who the least is known of all of them. If this were the case, maybe Aaron Jr. had more to do with circumstances than I know at this time. One thing is for sure….the complete story will probably never be known but hunting down clues is half the fun of it all. One more thing is pretty certain too….Sarah Woodward, who in all likelihood is the very first Woodward ever to be born in Butts County Georgia, was not the pariah of the family, nor was she expunged…the most probable explanation as to why her name was lost and never inscribed on the Woodward Monument with her brothers and sisters is that she was most likely forgotten about. If you look at the facts, she was at least 22 years older than her youngest brother Robert and she was married and living away from her family with Thomas McClendon-maybe in Henry County for a time but definitely in Alabama afterwards-when Newdigate was born. William and Aaron Jr. were small children. She wasn’t around a lot back then because a trip from Alabama was long ordeal and you just didn’t do it for any reason. After she married Thomas, she might have only come back to Butts County three times, if that many….once for her mother’s funeral, once for her father’s and maybe once more to sign papers with the others initiating the lawsuit. Farming people didn’t write a whole lot back then and the telephone was years away so Sarah was just a name and a distant relative that came rarely to visit and probably never stayed long due to the demands of her own family. By the time the monument was erected in 1939, the only Woodwards by name were the descendants of the four boys, if the name made it that far in all four lines. The Woodward women married others and took new names and had children by those names and they likely changed a few times more. All of Aaron’s children were long dead by then and his grandchildren were elderly. Anyone that had been alive when Sarah died in 1855 would have been at minimum 84 years old by then. There really was no one left to remember Sarah Woodward McClendon and quite possibly, many written records were lost or destroyed during the Civil War or by time itself, which marches forward continuously, just as the feet of many of Aaron Woodward’s descendants have marched forward, spread out and multiplied. She was not the lost daughter….if anything, she was the forgotten one, whom time and distance slowly erased the knowledge of as surely as time and nature are slowly erasing the inscriptions on the markers of her parents and those of her siblings today. Her name may not be on the great monument with the rest of her family as it deserves to be but she is as much a part of the Woodward family and of the history of my county as any of them are. Sarah Woodward is not lost and she rests in peace today alongside her husband Thomas McClendon in the Milltown cemetery in Chambers County, Alabama. Welcome home Sarah. I do like your post but disagree with whether Sarah was forgotten or lost, or disowned. Sarah married in to a family of Baptists and I believe as her father Aaron was a Quaker that he did disown her for her marriage to Thomas. I held your post until I could do some more research. I would be interested to see any information that would substantiate this. According to the records in the courthouse, Aaron was a Presbyterian. There are no records of Quakers settling in this area and Aaron’s ownership of slaves would seem to be contrary to Quaker beliefs. Since the man Sarah married was from Alabama it would make sense that she would move back home with him. Still, you present an interesting observation. You could very well be correct. I received the information I posted from another descendant of Sarah Woodward and Thomas McClendon. I like your story better. However, I understood Sarah had to fight for her portion and did receive some cattle. Just shows you how things can get distorted or not. I would love to hear the information that you have or rather see it. I had heard from other descendants that Sarah was the executor of the first will and that the son of whom you speak did not know there was a Sarah. I do know there is a McClendon on the McClendon DNA Facebook page who is researching the Woodwards but don’t remember just how he is kin. You are welcome to contact me at my email address. I would love to know the lineage of Sarah Woodward after she left Butts County. Please feel free to post here if you like! Hi all, I would love for us all to get some of this organized and sorted out. I have done a lot of research (25+ years) on the Woodwards and have a lot of info. Unfortunately my time is limited.. as I have two young children and I work full time. I’m off for a few days starting tomorrow so I will attempt to pull out some things of interest. I can scan them so they can be shared. Maybe we can set up a private facebook page so we can share info or do it through shared emails. I am a descendant of Aaron & Chloe’s son William J. Woodward. Williams son Nathaniel was my great grandfather. My grandmother was Mary “Hilda” Woodward Dailey.